The Formula 1 series continues TAG Heuer's long-standing relationship with car racing. The titanium or stainless steel watch has a tachymetric bezel, allowing you to measure speed. Keeping true to their racing roots, some versions are chronographs. The Formula 1 plays an important role in the history of TAG Heuer. It was the first series introduced after Techniques d'Avant Garde (TAG) took over the company in the 1980s and added TAG to the name. In the beginning, the Formula 1 had a more colorful design with plastic cases in bright yellow or red, some with dials to match. Sporty watches of various sizes and designs belong to the Formula 1 series, nicknamed F1. Overall, the series contains more than 50 individual models, making it one of the most extensive TAG Heuer series. The watches are predominantly homages to car racing, though some can be used as diving watches. TAG Heuer outfitted the series with mechanical as well as quartz calibers and the watch is available in four different large diameters: 41, 42, 43, and 44 mm. The series mainly features black and gray dials, although other colors are also available. The most common features on racing watches are fixed tachymetric bezels and integrated stopwatch functions. When a watch features the latter, it becomes a chronograph. The majority of the F1 models have a tachymetric bezel, which allows you to calculate average speed per hour. In order to do so, you start the stopwatch and stop it after a kilometer. The large second hand then points to a number on the tachymetric scale, which is equal to the speed. The possible values on the bezel range from 60 to 240 km/h (37 to 150 mph). The large second hand is responsible for measuring time up to a minute. Two subdials are responsible for longer periods of time and keep track of minutes and hours. The third subdial is the running second counter on chronograph versions of the F1. If you're a fan of car racing and looking for a watch to match your passion, then you should seriously consider the Formula 1. It's available in a variety of designs, the majority of which are chronographs with tachymetric bezels. The F1 remains an affordable watch. It costs around 800 euros for a new quartz model. Mechanical watches start around 1,000 euros. The chronographs cost around 1,700 euros, but often go for over 2,000 euros. This is especially true for versions with black cases. Vintage mechanical F1 watches don't really exist yet, as the series is still relatively new. 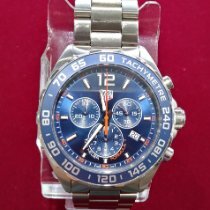 However, because the series began with colorful quartz watches, you can find used, early F1 models in good condition for around 200-300 euros. TAG Heuer doesn't only use stainless steel for Formula 1 cases. Some models are made of titanium, which is especially lightweight and robust. The matte gray surface of the material emphasizes the sporty look of the series. The stainless steel models are completely black thanks to their titanium carbide coating. The coating is a mixture of titanium and graphite and is considered very hard and scratch-resistant. The bezels of many different Formula 1 models also have matte black titanium carbide coating. TAG Heuer uses a ceramic or aluminum bezel for other versions of the F1. The all-black F1 models are truly head turners with their fire-red or yellow contrast elements on the dial and bezel. 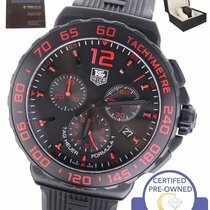 Their tread pattern black rubber strap goes well with the watches' look and features the company's name, TAG Heuer, in raised lettering. The bicolor Formula 1 models have their own special place in the collection. The bezel, crown, and middle link of the stainless steel bracelet are coated with a yellow gold coating, while the other parts of the satinized stainless steel remain visible. Even more remarkable, however, is that these bicolor models were designed as diving watches. They can withstand pressure up to 20 bar and are waterproof to 200 m. They feature a unidirectional bezel with a zero marker as well as a screw-down crown. A quartz movement powers the watch, which also has a battery end-of-life indicator like all TAG Heuer quartz watches. The battery life usually lasts at least two years. When the second hand begins only moving in four-second increments, you know the battery is losing power. Waterproofness to 200 m is not just limited to the bicolor quartz models. Pure stainless steel and mechanical versions of the F1 are also waterproof, although they resemble racing watches more than diving watches. Some of the quartz models have an alarm, which is a useful additional feature. The alarm time is displayed on a subdial. TAG Heuer features several special edition models in their F1 collection. These are identifiable by the writing on the bezel, where "Tachymeter" is normally written. 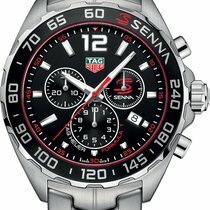 TAG Heuer offers the Senna Special Edition, a 43-mm chronograph, with the last name of the three-time Formula 1 World Champion, Senna, on the bezel. The dial is anthracite with red color accents. The Indy 500 is dedicated to the race of the same name, which takes place at the Indianapolis Motor Speedway in Indiana, stretching over a distance of 500 miles. It's one of the most well-known car races in the world with a history reaching back to 1911. The stainless steel chronograph is 42 mm in diameter, with a tachymetric bezel featuring the inscription "Indy 500." This quartz model also features an anthracite dial, which has a sunray effect when light hits it. 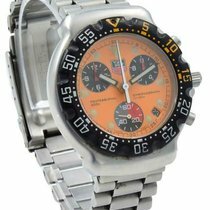 The three subdials shine silver, while the large chronograph seconds hand is red.